Is Time Management Just a Myth? Time Management is essentially important in the workplace. Without Time Management, deadlines are missed, reports are not submitted, important meetings are forgotten, and many more. In the end, we are faced with a chaotic long list of activities and deadlines with not one being completed or done. When companies and their people are in this chaotic working environment, companies can expect the worst – sales targets are not being met despite so much time used and wasted. Use the right to-do list. Process tasks in the right way. This is a mistake. Today, every employee and manager could work every single hour of the day and night and still not keep up. Every day, work schedules are affected by uninterrupted stream of information and communication. Because of social media, people have crossed borders of communication making everybody unceasingly accessible. Work schedules are just being disrupted. Yet, with the volatility and complexity of the business environment, Time Management has become a necessity. Organizational problems are not considered within the domain of Time Management. Time Management is often seen as a simplistic solution to complex organizational challenges. Yet, most behavior-change challenges are simply about how people spend their time. 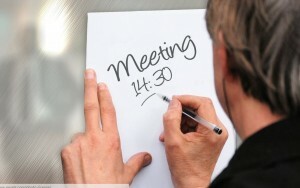 Time Management by Six-box To-do List is a personal approach to Organizational Time Management. It is an organizational Time Management framework that builds on transparency and strategic alignment. Executives, managers and employees are empowered to push back when asked to do much work that can distract them from their strategic focus. The framework brings distraction into the open for discussion. Companies get to review these distractions and determine whether it is worth accepting or resisting. With Time Management by Six-box To-do List, the normal goal-setting is taken one step further. The likelihood of follow through gets to be established and incorporated in the company’s action plans. Time Management by Six-box To-do List is a straightforward approach. We just have to follow 4 direct but simple to follow steps. Identify 5 things to focus on. Help your direct reports create their to-do lists. Identifying the 5 things to focus on will direct companies to spend 95% of their time on what are important. Companies that have completed this step were able to determine the most important 20% of their goals that helped the companies reach the top. Focusing on what is most important became the company’s battle cry when entering a business environment that has become so competitive that there was no way to go but up. Step 2: Create a Six-box To-do list. Creating a Six-box To-do list can be simple as A-B-C. Yet, it can be complex when companies are not clear on what or where they need to focus on. Creating a Six-box To-do list allows companies to concretely review overflowing to-do list and segregate tasks which are considered top 5 priorities. The sixth box is known as the “other 5%” box. This is where other tasks that do not belong in the top 5 priorities are placed. Perfecting this step is only achieved when tasks are appropriately assigned in their appropriate boxes with the “other box” having none or less of the mission critical tasks that cannot be deleted. Step 3: Help Direct Reports Create To-do List. Every member of the organization must be aligned with the top goals of the company. Priority actions must be aligned towards a common direction. This can only be achieved when each and every member of the organization have To-do list that come out from their direct supervisor’s top 5. This continues up the hierarchy until each one’s To-do list is traceable to the CEO’s top 5. When this happen, companies can be sure that there is consistency of action, concentration, and focus. Step 4: Manage without Micro-managing. Micro-managing has never been effective in organizational management. There is extreme resistance when micro-managing is applied as a management style. Yet, this approach is sometimes employed when companies need to make sure that their people deliver. Time Management by Six-box To-do List however allows companies to manage people without micro-managing. In a quick glance, companies can look at their employees’ priorities and actions and determine if they are moving forward to achieve the top-5 areas of focus. Time Management by Six-box To-do List is an effective tool of directing people towards focusing on what is important without micro-managing. In the end, results are achieved with people in every level aligned to the top-5 goals of the company’s CEO. Interested in gaining more understanding on how to achieve Time Management using the Six-box To-do List? 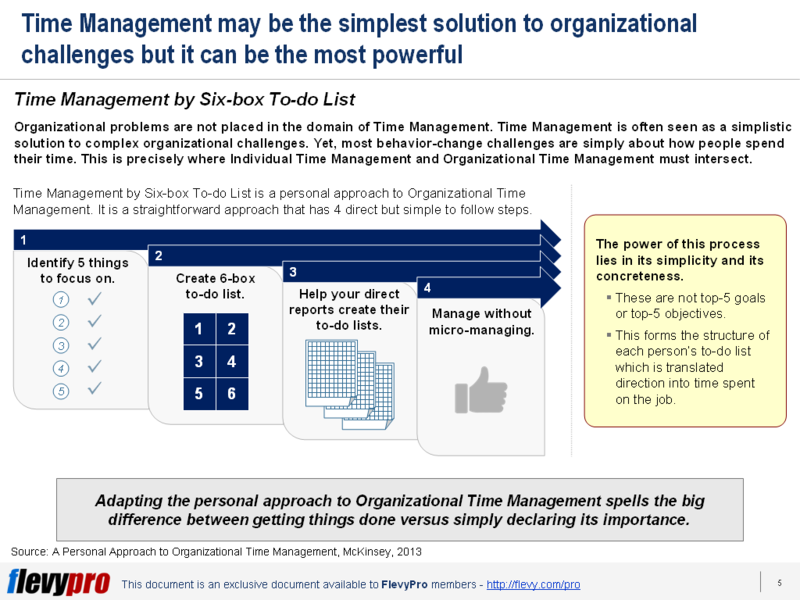 You can learn more and download an editable PowerPoint about Time Management by Six-box To-do List here on the Flevy documents marketplace. What Type of POOR Time Manager Are You?